Greek!) Thanks for this lovely post and bringing back this memory for me. I loved every single bit of this post, and even more so after reading the last line. you had me at whipped feta. I’m not sure why, but I would never have considered whipping feta. Why not? I don’t know. It seems so simple really. I’m not a cream cheese person, so would probably use Mascarpone (for me, yes, there is a difference), or try the Greek yogurt just for kicks. This sounds fabulous w/ tomatoes fresh from the garden. Oh yea. Made this last night– it is amazing! Thank you for another fab recipe! Question–Can i make this the night before? I want to make sure it will keep OK…What do you think? This looks FREAKING AMAZING!!! I can see this spread all over stuff. I’m going to give this a try tomorrow. I make goat milk feta and chevre so I’m going to use that instead of cream cheese and just whip the 2 together. If it’s great I’ll be serving it on Thursday (thanksgiving) and I’ll let you know. I was looking for a feta based dip or spread. I first tried whipped feta at The Purple Pig in Chicago- It was the most amazing thing I ever ate! This had marinated cucumbers on top. Seriously, one of the best things I ever ate. The chef submitted the recipe and it’s online. I first discovered spreadable feta when I lived in Australia and thought I had died and gone to gastronomical heaven. It’s that good. Sadly, when I moved back to the States, I could no longer find this epicurean delight. It was briefly available in select stores and has since disappeared. 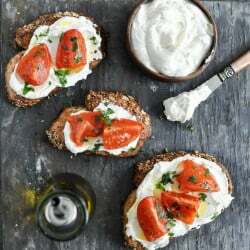 Thank you so much for posting this recipe – I’m sure I will spend the next few days basking in the glory that is whipped feta on anything. And everything. I mean seriously everything, like toast and pretzels and pasta and chips and cereal and soup and maybe even ice cream…. Did you know you can BUY creamy feta? Surprise! I was in the Middle Eastern market the other day picking up falafel and shwarmas for dinner and walked over to the refrigerated food and saw what I thought was the crumbly-type feta so I bought some. When I got home and opened it, it was creamy. I’ve been using it in my salad but came here to find out what else I might do with it. Hint: If you have a Middle Eastern store in your area it’s well worth it to buy your couscous, feta, middle eastern recipe stuff there — it’s authentic and considerably cheaper than the regular grocery store prices! Enjoy! Oh dear goodness!!! Why did I have to see this at the start of a long work day???!!! TORTURE!! !